In 1877 Milton W. Hinkle of Memphis, Tennessee, invented a simple adding device, which he patented on 5 March, 1878 (US patent 200911) (see the lower patent drawing). The machine was somewhat similar to the earlier devices of Jabez Burns and John Ballou. 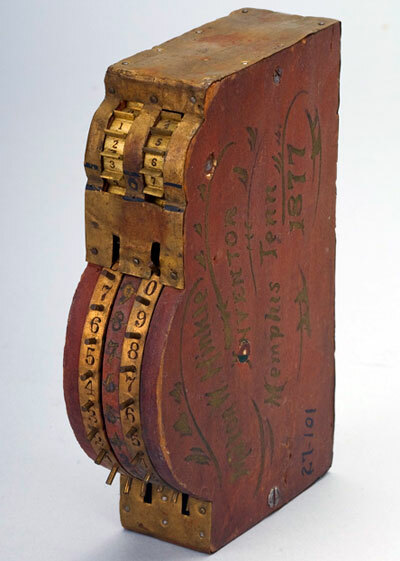 The patent model of the device survived to our time and is kept now in the collection of National Museum of American History in Washington, D.C. 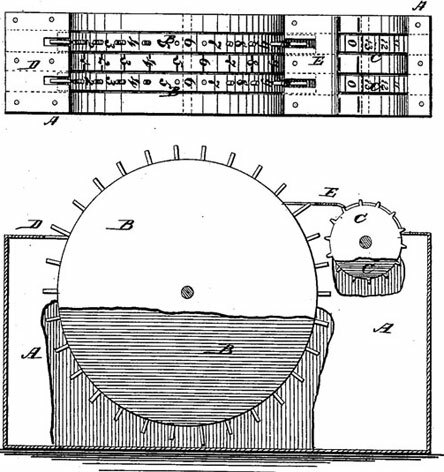 The patent model (see the lower image) has wooden sides and a brass strip that covers the front, bottom, and back. The top of the instrument is curved at the front to the shape of two wheels that rotate inside it. A strip of wood between the wheels has the digits from 1 to 9 marked on it. Each wheel has the digits from 0 to 9 marked on it three times. A pin protrudes from the wheel between each digit, and each tenth pin is slightly longer than the others. The spacing of the digits is the same as that on the case. The large wheels are linked to two smaller toothed wheels at the back of the instrument. These smaller wheels are marked with the numbers from 0 to 13, and are meant to move forward every time the large wheel passes a longer "10" pin, recording numbers that should be carried. These very simple adding device even doesn't have separate wheels for registering results. The operator places his finger upon the pin of the wheel B opposite the index-number representing the figure to be added, and turning the said wheel until his finger strikes the finger-plate, all the wheels being adjusted before beginning with their zeroes in the first place above the plates D E.
The information for the inventor is very scarce. Milton Washington Hinkle Jr. was born on January 8, 1848, in Carrollton, Carroll County, Kentucky. He was a son of Milton Washington Hinkle (1810-) from Louisville, KY, a steamboat owner on the Ohio river.